1 Botanical Cleanser - $18.95ea. 2 Botanical Cleanser - $16.95ea. 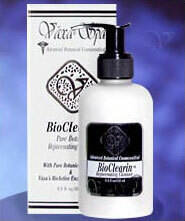 Each BioClearin Botanical Cleanser is 6.5oz. Deionized Water - Purified water that is the result of electromagnetic filtering, removing close to 100% of mineral deposits and all other foreign organic and inorganic materials. Planteren - This is an all natural "soapless," non-sulfate cleanser derived from wheat, corn and soya. Used for especially sensitive skin, or for those not wishing the alkaloids and sulfates of most soaps. Planteren cleanses but does not strip the skin of essential oils. Glyceryl Cocoate (Peg-7 Glycerol Cocoate, Glyceryl) - An organically derived humectant used primarily in cosmetics and cosmeceuticals, useful in binding organic ingredients, keeping them bioavailable, while giving a smoothing texture for ease of application and assimilation. Cocamidopropyl Betaine - An organically derived substance from the salts of coconut oil and used as a foaming and cleansing agent primarily in cosmetics and cosmeceuticals. Betaine is a methyl donor useful in reducing homocysteine buildup within the skin, while reducing the possibility of free radical cascade damage. Cellulose (Methyl Cellulose, Purified Cellulose) - Complex chained carbohydrates common in both plants and animals, generally making up the structural elements of cells, organs and bodies, e.g. cellulose fiber. Cocamide DEA - An organically derived mixture of ethanolamides of coconut acid used to build lather and thickener in cleansers primarily in cosmetics and cosmeceuticals, while also useful in adjusting the pH of the skin. Safflower Oil - Vaxa uses oil derived from the safflower seed as an absorption base for our Fruit Oil Extracts. It also shares with the other essential oils the properties of being a humectant and a skin softener. TEA - Often used in cosmeceutical prepartions to adjust pH values, and used to convert the acid in fatty acids to salt (stearate). When used in small quantities, it acts to safely bind ingredients effectively., Should not be used with nitrates. Octyl Palmitate - An organic fatty acid complex derived from palmitic acid (see EFA's) used primarily in cosmetics and cosmeceuticals useful for gentle cleansers. Seaweed (Seaweed Extract, Seaweed Oil Essence, Sea) - According to an article in Skin Inc., seaweed, like sea water, is similar to human plasma. Seaweed contains vitamins, minerals and amino acids that benefit the skin by rebalancing, nourishing, hydrating, detoxifying and purifying. The plant itself has no roots and absorbs minerals and vitamins from the sea. There are more than 20,000 different species of seaweed present worldwide. Gotu Kola (Centella asiatica, Hydrocotyle asiatica) - This herb dates back to India where it enjoyed a reputation of being a plant which promoted longevity, and has some historical significance too, in that it has been used by religious organizations which claim that it heightens spiritual powers. More practically, their leaves are known to have a marked nutritionally energizing effect on the brain without increasing stress. Often confused with the kola nut, it is not related; nor does Gotu Kola contain any caffeine.In fact, its properties are said to allow a brightness of the spirit while bestowing a calming influence at the same time. It contains a natural soothing agent believed to stimulate the energy levels within the body without raising stress levels. This legendary herb is also considered a "tonic," a natural water eliminator, stimulating the body to release stored water masses. Several studies have shown that Centella aids in the development of strong connective tissue, actually stimulating the production of compounds which make up the "ground substance" where collagen fibers are embedded. Centella has also demonstrated some enhancement of the venous flow into the lower limbs, aiding in some improvement of varicose veins. The extract's effect on cellulite appears to be linked to this latter capacity for its ability to promote connective tissue structure and reduce sclerosis of target areas (hardening). Comfrey (Comfrey Extract, Boraginaceae, Symphytum) - Historically, it is spoken about as the herb with powers of rejuvenation, although there is no such proof to date. The impressive array of beneficial substances undoubtedly has given claim to comfrey's appellation of a miracle worker. Indeed, they are many and include calcium, potassium, phosphorus, vitamins A, C, and B12. And quite interestingly, it has more protein in its leaf structure than any other known member of the vegetable kingdom.From two to five crops can be harvested yearly, depending upon the climate, and it is used widely as a healthy fodder for cattle. Quite amazingly, this little plant sends down a tap root 10 ft. and longer into the soil to raise moisture and valuable minerals to the upper levels so as to enrich its foliage.The roots and leaf structure are known to contain allantoin, a protein that is thought to encourage cell division and reproduction, which is perhaps why it has been credited historically with some rather remarkable resolutions in body problems, from stubborn leg ulcers to broken bones. Exceptionally effective, too, is its wondrous workings on skin inflammations, such as rough skin, sores, burns and chafing, as well as being useful in reducing the swellings and puffiness of the facial musculature. Citric Acid One of the Alpha Hydroxy Acids, it is thought to be a natural moisturizer inherent within the skin when we are young. Propylparaben (Propyl Paraben) - An antifungal preservative. Butyl Paraben - Used in advanced cosmetic formulas as a natural, nonirritating organically derived, preservative, while maintaining the stabilization of formulations without the oxidation of active ingredients.